Want to make a cute party banner? I know what you're thinking: I don't own a sewing machine. I don't know how to sew. I don't even care about sewing. 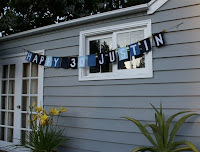 Last summer, before I gained a bit of confidence and experience on my trusty sewing machine, I decided that I wanted to make Justin a banner for his 30th birthday. But I needed a no-sew option. I also happen to love hot glue guns. And so this is what I did, and you can too. 1. Figure out what you want the banner to say. In my case, I went with Happy 30 Justin, so that I could avoid the super long "Birthday" and still get his age in there. Count your letters. Then count any spacer flags you want. 2. Go on down to your local craft store and pick up some cheap felt. It's probably in the kid craft section, or poster board section. It comes in 9x12" rectangles and they usually carry it in all the primary colors, plus a few more. It's super cheap (probably $.25-$.50 a piece?). 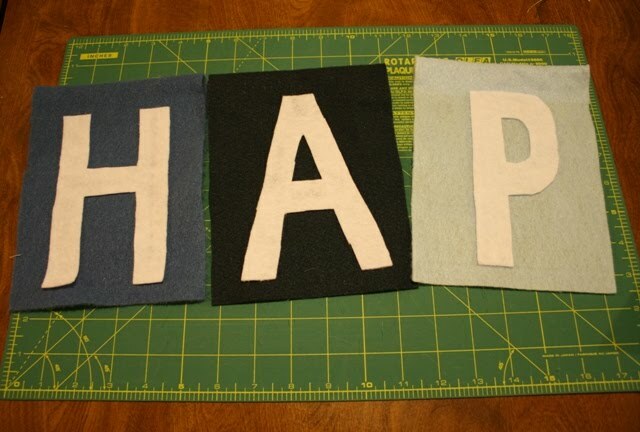 You will need half a piece per finished flag, and half a piece of white per letter. So for mine I bought 8 colored squares, and 7 white. 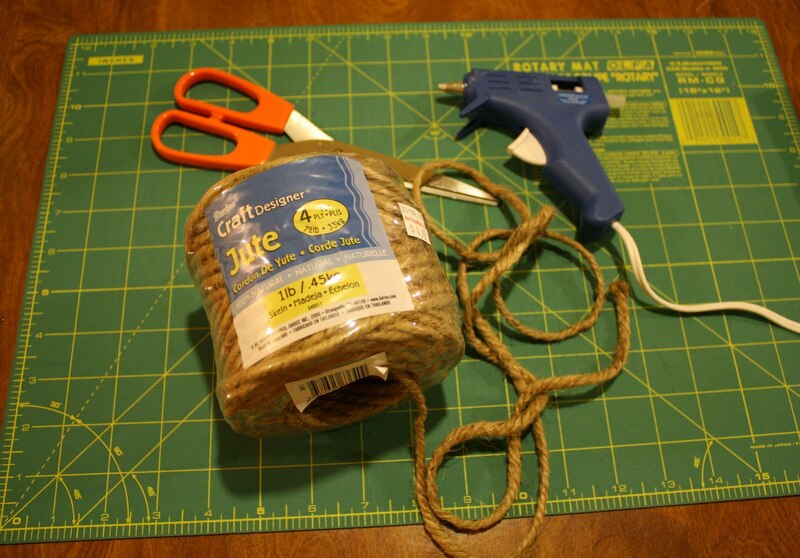 Pick up a spool of craft jute (its like twine) for a few bucks. Each flag is going to be 6" wide so if you decide to use string or ribbon you already have, the length will need to be 6"x (number of flags) + 1' extra to allow for loops at the end. If you don't have a glue gun, get one! They're super cheap and you'll come up with a zillion uses for it. Buy it! Plus, I'll show you how to make some magnets later. 4. Turn on your glorious hot glue gun. Make sure its hot enough so that the glue flows nice and gooey. Decide on your back side. At my craft store they put the price tag on each felt square, so when I took that off there was a funny square spot, thus this became the back. 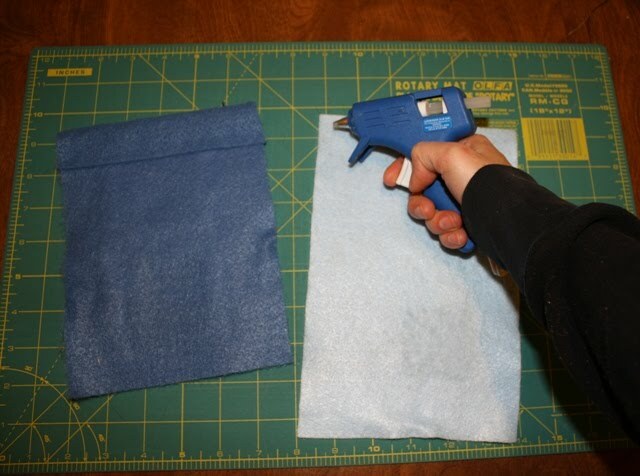 Lay a line of glue along the top edge of the back side, then fold it down 1.5". 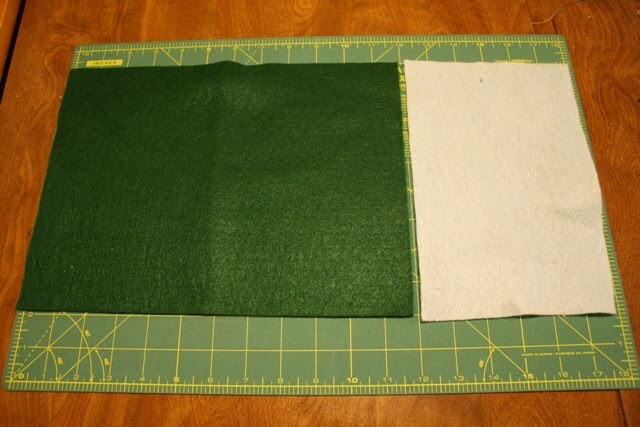 You will need to be able to pass the jute through this fold/hem. Lay it aside to cool. Repeat with each flag. 5. Cut your letters. I made mine about 6 inches high by 4" wide. So technically you could probably get three letters out of each white piece of felt if you want to buy less. I'm just not that into careful cutting. And I wanted big bold letters. 6. Now that all the flag hems are glued and cooled, glue on the white letters. I waited for this step to glue the letters to ensure the letters would line up with each other. Allow them to cool really well. 7. String up your lovely work. I put glass balls between each flag (benefits of dating a glass blower...) but you could experiment with other things or nothing if your flag is long like mine. I tied a loop to both ends of the string to easily hook to some nails. Love it! We should make that a craft night project. Maybe, just maybe, if you hold my hand through the process once, I'll be able to duplicate it a few more times.